The third March and Walker Crime Novel. On a cold morning in late April, a man and his dog discover the body of a young woman in the ditch alongside the picturesque Thousand Islands Parkway in Leeds County. The woman was stabbed multiple times before being dumped. Detective Constable Kevin Walker of the Ontario Provincial Police discovers that the victim worked for an old high school acquaintance of his. Kyle Baldwin now runs a charity that raises funds for mobile medical clinics in Kenya, but he had a brief affair with the victim several years ago that ended badly. Why did she continue to work for Baldwin? Did she see someone else after breaking up with him? Meanwhile, Detective Inspector Ellie March is investigating the mayor of the nearby city of Brockville for alleged criminal wrongdoing. Now with two major cases to manage, she and Kevin Walker must determine if the mayor is somehow connected to a wider circle of crime or if Kevin’s friend, Kyle Baldwin, murdered his ex-lover in a fit of jealous rage. 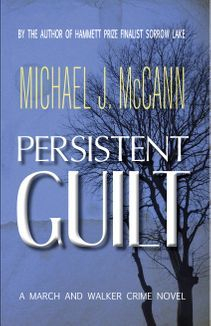 Ask your local independent bookstore to order PERSISTENT GUILT in paperback for you. It's available world-wide through the Ingram catalogue.